Heidi’s Bier Haus slot is another addition from WMS based on drinking beer in a typical German fashion, giving a feel of Oktoberfest, served by the lovely beer maiden Heidi. This theme is all about being lively and happy by immersing the player in a genuine German bar. Housed in the Twinstar J43 Cabinet, used by several big titles from SG Gaming like Dancing Drums slot, the player is presented with an enormous screen that’s simple and intuitive to use. The screen is colourful and vibrant, in part because of the technology of the Twinstar J43 cabinet, but also because the game itself takes advantage of the display to create an engaging and fun environment. Heidi’s Bier Haus slot features 6 reels with a whopping 50 paylines. While some may enjoy this game as a penny slot, the maximum bet is 600 credits so it can be tailored to suit your needs. And with an RTP of 96.13%, the game is already starting to sound very appealing. As well as this, we have the Wild symbol, represented as a large pint of ale. This substitutes all other symbols apart from green, purple and red Heidi. Lastly, there’s green, purple and red Heidi, who can be used to trigger bonuses and free spins. It’s worth noting that red Heidi only appears on reel 4, while the 6th reel contains only wild, Hans and green and purple Heidi symbols. Tapper Bonus: Before each reel spin, several random positions on reels 1 to 5 will be randomly replaced with other symbols apart from club and red Heidi. The Tapper feature can be triggered randomly at any time giving between 1 and 6 reels to become fully wild, substituting for all symbols apart from Heidi. Free Spin Bonus: If 5 or more scatter symbols consisting of red, green or purple Heidi appear in adjacent reels, the free spin bonus will be triggered. This will award between 5 and 100 free spins depending on how many Heidi’s appear. The number of free spins increases in increments of 5 for every additional Heidi, up to 19, after which 100 total free spins are awarded. The free spins can be re-triggered at any time and use a different set of reels. Wheel Bonus: If red Heidi participates in the bonus trigger combination, then the player will receive a spin of Heidi’s wheel, which will be awarded before the free spins. 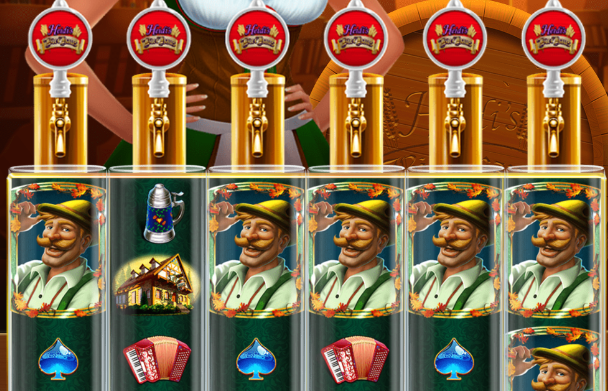 If the pointer lands on Heidi, Hans, the pretzel or accordion, then the value shown on the jackpot meter is awarded, along with an additional spin. If the beer slice is chosen, then 3 wild Hans spins are awarded in which between 4 and 10 wild Hans are randomly added to the reels to take positions apart from those which are already occupied by persisting wilds. Finally, the extra spin slice will give the player an additional 5, 7 or 10 extra free spins. If purple Heidi participates in the trigger combination, each one is then replaced by a persisting wild, which locks in place for the entire of the free spin bonus. If a green, red or purple Heidi land behind a persisting or Hans wild, then that symbol will still count towards any potential trigger bonus. While it may seems like quite a complicated game, it is in fact fairly straightforward and you’ll quickly pick it up. The various awards from the bonuses certainly help the game to remain engaging, and coupled with the sharp and colourful display from the Twinstar, this game will certainly keep your attention while you play.